Fig. (4) (Color online) Upper panel: Wavelet spectrum of Antarctic temperatures Pet . 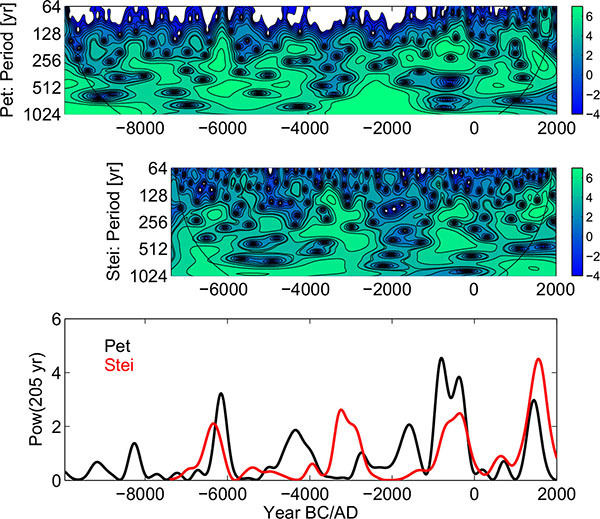 Middle panel: Wavelet spectrum of solar activity Stei . Below the cone of influence, wavelet results are not significant. Lower panel: Spectral power for the period of ~190 years taken from the two wavelet spectra, powers in arbitrary units.